Kwikset has quite a few smart entry lock brands under its umbrella, including the Kevo, SmartCode, Obsidian, and Convert series. 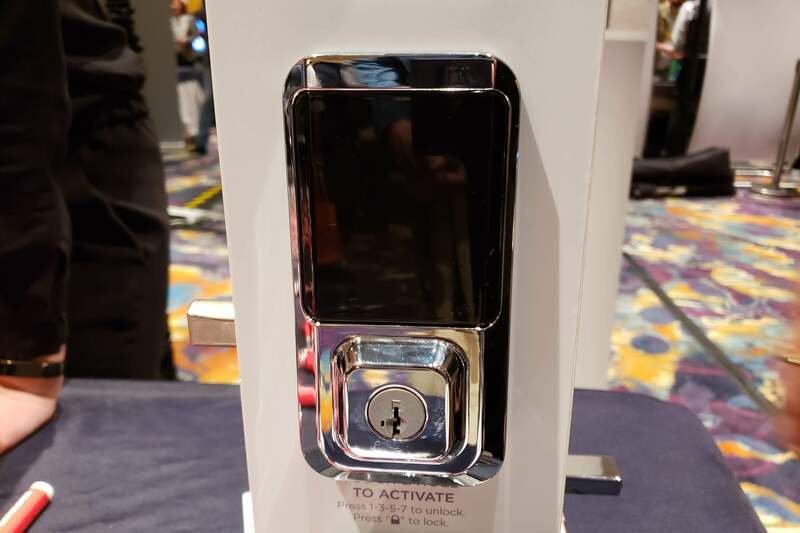 Today we can add two more brands to the list: Halo, Kwikset’s first Wi-Fi connected smart lock, and Aura, an all-new Bluetooth lock. Halo is aimed at consumers looking for a simple connected lock that doesn’t require a smart home hub or bridge. Using Wi-Fi enables the Halo to connect directly to the consumer’s router, at which point they can control it with a new smartphone app or integrate it into a broader smart home system. But battery life is the reason why so many other lock manufacturers have stuck with low-power technologies such as Bluetooth, ZigBee, and Z-Wave for their smart locks. Wi-Fi has always been a battery killer, so it will be interesting to see how long the Halo can last on each set of four AA batteries. 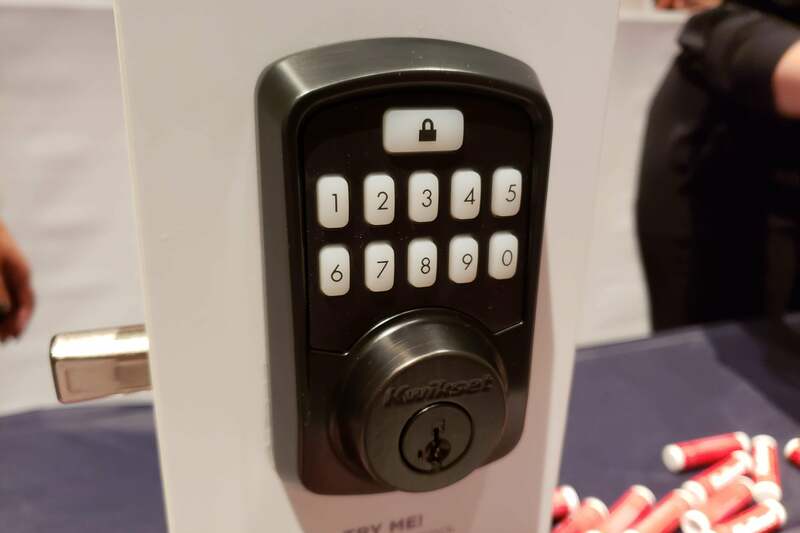 Kwikset’s Halo Wi-Fi smart lock (touchscreen version). A keypad button version of Halo (shown at the top of this page) will cost $199, and a touchscreen version (see immediately above) will sell for $229 when both models come to market later this year. 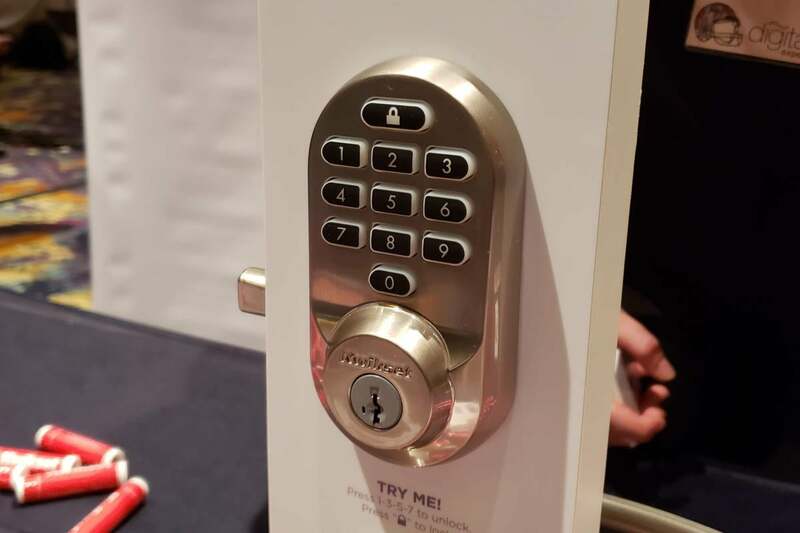 The touchscreen version will feature Kwikset’s SecureScreen technology, which displays two random numbers that the user must touch before entering their PIN code to unlock the door. This scheme results in the user touching all the numbers over time, so that a burglar can’t determine the PIN by the pattern of fingerprints left on the touchscreen. The simpler Kwikset Aura will cost less than the Halo—$149 when it ships later this year—but being Bluetooth based, it will require the homeowner to program and manage the Aura using the new Kwikset smartphone app while they’re in range of the lock. You won’t be able to do any of those things via the internet as you can the Halo. The Aura will also be available only as a keypad button form factor, there isn’t a touchscreen model. Kwikset’s Aura Bluetooth smart lock. None of that means the Aura is a dumb lock, of course; homeowners can generate and manage “keys” for up to 250 users, and schedule temporary access for guests, housekeepers, or other people authorized to enter the home. A smartphone is not required to lock or unlock the Aura. This story, "Kwikset goes Wi-Fi with the Halo smart lock " was originally published by TechHive.